Perhaps a failed attempt at applying directional lighting on a model would be more like it. 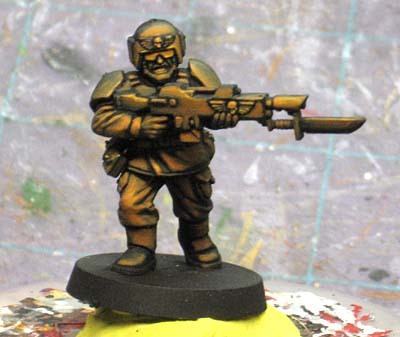 One of the regular Old Timers is looking to get into Imperial Guard and wants to paint his army up so they are a bit different than your regular Imperial Guard paint scheme. Sounds like every Space Marine player I know... "But I want mine to be different." My little bit of Object Source Lighting experience only goes so far. When I've done it, the object was usually on the model and the "glow" was not very bright and only illuminated a small portion of the immediate area. This might be a bit different. I said I would paint up one guy to show him what he might look like if he were crossing an open battlefield at night. The moonlight to his back and the "flames" of war in front of him. 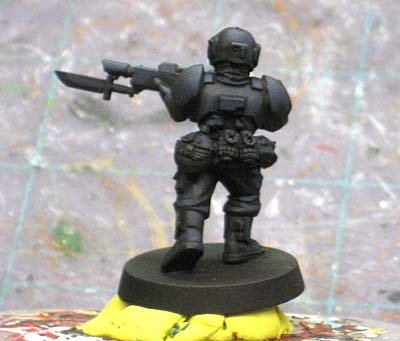 For the back, it was a dark-bluish grey that I used to highlight the top surfaces of the model. I figured this would simulate moon "light." For the front, I used an orange to simulate the light from fire in front of him. It took a few passes to build it up and I used a brighter yellow in a couple places for some contrast and to show the different textures (reflective qualities) on the model. And then a look at the side of the model where one color meets the other... almost. Turns out, this isn't what he was looking for at all, but I think it may have helped him figure out how to get the results he does want. I think OSL is one of those things that can be tough to explain to people and they don't really know what it looks like for sure, BUT... they certainly know when it looks wrong to them. With as many models as the average Imperial Guard army has, he should be an expert in this by the time he's done with all his troops. Hopefully he'll figure out how he's going to do it and he'll end up with a great looking force in the end. while its certainly a nice paint job, with some good highlighting and colur shoices, I think that OSL only really works if you can see the source. I can see an army like this working, but imo it would need several light sources, possibly of different colours and intensities modelling on the figure. burning wreckage on the base, discarded torches/glowstick on the bases. spotlights, flashlights etc on the figures and glowsticks pushed through belts/helmet straps all might work to make this a really cool looking army. If I had tried this out I would have painted up the model in dark colors only first and the brighten them up in the same color where the light hit and then finally add in a "light color", the orange in this case. I probably also would fail completly :) It's quite a cool idea though but maybe better suited for a display as the facing and order of the army will change when you play and the effect look odd as the light sources gets jumbled. It's not bad! The first thing I thought even before reading the post's title was "what's up with this guy, he looks like he's in front of a campfire...!" Then I read it was about OSL and it made sense. It looks good, but I think to get the full effect you'd want the light source to be stronger in some areas. 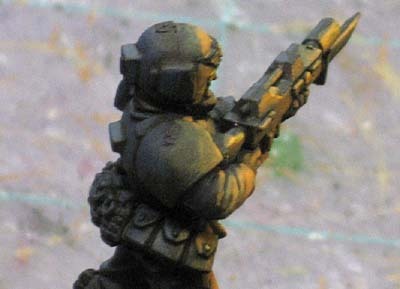 For example, if the light was above the troop's head, his boots would be a darker shade than his helmet. 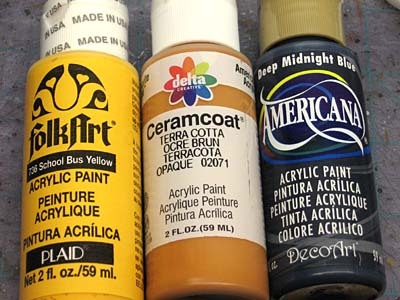 What you could do Ron, is to, instead of painting areas that caught the yellow light, well, yellow just paint them as they would normally look, but much darker.. and the areas that are not in the light that dark blue.. So a very dark camouflage pattern on the front, and a very dark weapon with strong highlights on metallics, and a very dark backside on everything. I think one of the reasons the effect doesn't quite work is that you haven't taken into consideration how light plays off different surfaces and materials. For example, cloth tends to be much less reflective then the lasgun (if it were made of metal and unpainted). At the very least, the bayonet, the glasses /gogles and the aquila should all be reflecting a lot more then the rest of the uniform. I think it's a great idea, and you could easily build a display board with a few lights standards that would really drive home the effect. Any links to those VC Blaise? I think the thing that stands out to me most is that the light is even all over the front, not just a small section or a quarter and I think that would improve it. Apart from that, interesting effect, thanks for sharing the test. An airbrush would of made it much easier. But for a first try it does look impressive. I really like the result - as most already mentioned, OSL works best if the light source is visible. But I really like your description of how you did it (as it was different from what I tried so far) and I'm sure I will try "your way" soon.